Dynamic billiards studies the motion of a small billiard ball (subject to no friction) on a pool table as it undergoes elastic collisions with the boundary (elliptical in this case). Alternatively, one can think of the path a light ray would take in the interior of a reflective boundary. 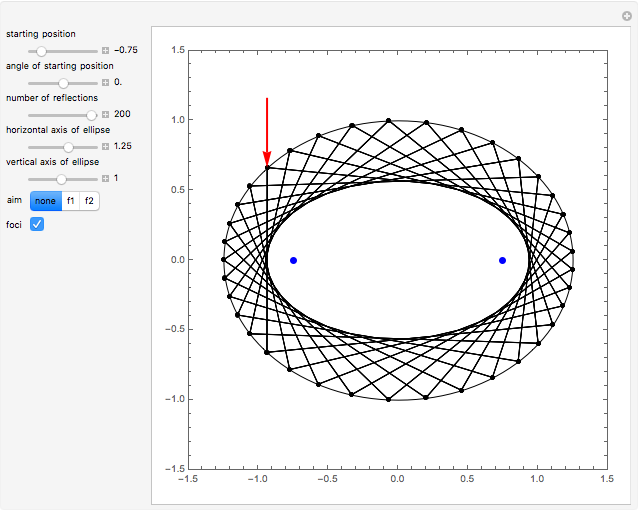 This Demonstration lets you choose the position and direction on the boundary at which the ray is injected into the interior of the ellipse (the red arrow). The "aim" buttons aim the ray at either focus, drawn in blue (they can be hidden via the "foci" checkbox). A well-known property of the ellipse is that a ray through a focus will bounce off the wall once and then pass through the other focus. 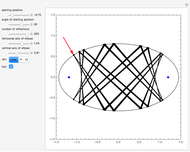 You can specify the number of reflections and the ellipse's semiaxes, and . 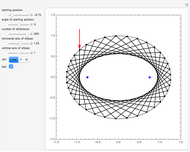 The eccentricity of an ellipse is the ratio of (the distance from the center of the ellipse to a focus) to the maximum of and . 1. 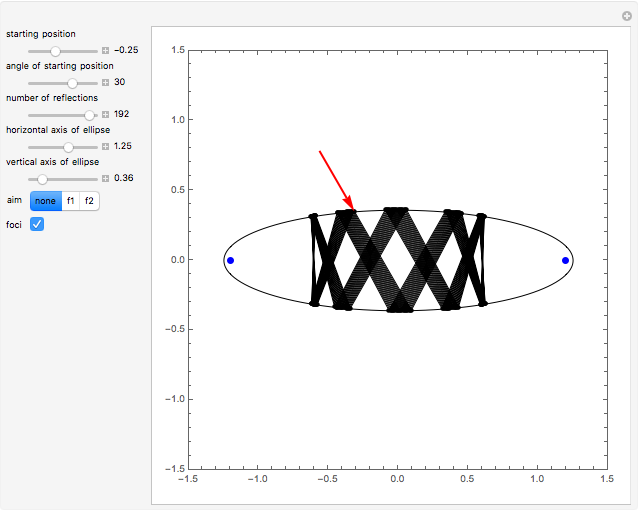 If the entering ray passes between the two foci, all the subsequent rays will be confined to that zone; they will be bounded by the two branches of a hyperbola (this virtual boundary is called a "caustic", from the Greek word for "heat"). Conversely, if the entering ray passes between a focus and one of the ellipse's vertices, all subsequent rays will be bounded by a confocal elliptical caustic: a smaller ellipse that shares the same foci as the original one. 2. For most settings of position and rotation, a path with many reflections will be disorganized and space-filling. However, for a sparse set of combinations, the path suddenly regularizes, yielding beautiful stable patterns, some of which have been collected here. These can contain 2, 3, 4, to any number of links. The constraints on position, rotation, and eccentricity that form closed paths are not obvious (except for trivial cases) and are related to roots of high-order polynomials (quintic and up). O. Knill. "Billiards." (Oct 18, 2011) www.dynamical-systems.org/billiard/info.html. S. Tabachnikov, Geometry and Billiards, Providence, R.I.: American Mathematical Society, 2005. www.math.psu.edu/tabachni/Books/billiardsgeometry.pdf. Wikipedia. 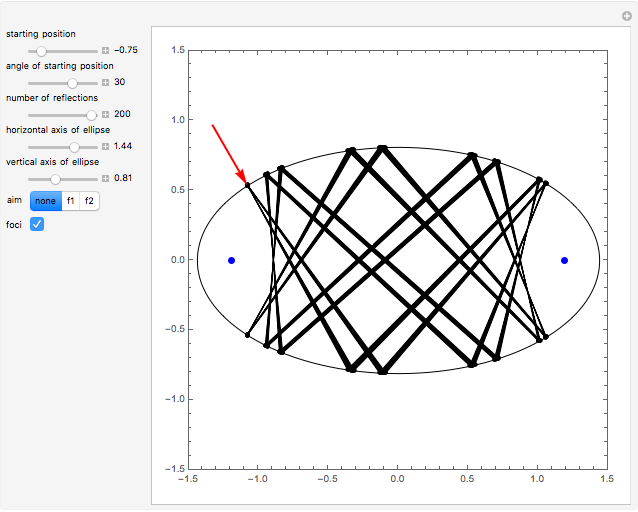 "Dynamical Billiards." (Oct 18, 2011) en.wikipedia.org/wiki/Dynamical_billiards. Dan S. Reznik "Dynamic Billiards in Ellipse"